Having seen how awesome King Hermes was, the Greek soldiers decided that he must be a god! Picture from the Japanese animated movie “The Golden Laws”, based on a book by Ryuho Okawa. There is a theme to my last few posts, and I want to press that point a little more. But to do that, I have to introduce someone with a difficult name: Euhemerus, an ancient Greek. His name means “Happy” or “Prosperous” (or something like that), so there is a pun in today’s headline. Anyway, his name may be difficult to you, but not to the people in the Macedonian court, where he was working. Macedonia, back then, was where Alexander the Great came from. Alexander inherited a pretty good army from his father, but still, he really did earn that name. He built one of the world’s largest empires over the course of a few years. He died young, and his empire fell apart, but it was still an amazing feat, and it also made communication possible between cultures that had until then been mostly apart. Old “Happy” lived a generation or so later, so had a most compelling case for the theory that made him famous: That the gods of old were actually men (and women) who had accomplished such great works that people thought they were gods. We shall bear in mind that Greek polytheism was probably a lot more like Japan’s Shinto religion (which I mentioned in passing yesterday) than Religion in the west today. The border between men and gods was already kind of porous, with heroes and ancient kings being seen as offspring of visiting gods, mainly Zeus. Many of these were considered historical persons, though some are no longer thought to be. In any case, if some of Zeus’ sons were men of great fame, why not the rest of him, and Zeus and his brothers and sisters too? So was born the theory called “euhemerism”, which claims that gods were once men who got excessive respect, usually after their death. This theory is also found in one of the Jewish apocrypha, still included in some Bibles today. It was also embraced by early Christian thinkers, although after the completion of the New Testament. The phrase “Those who you worship were once men like you” resounded through Christian history, apparently without the slightest irony. Yes, until recently it could be argued that Jesus Christ was the best documented example of a man being later worshiped as a god, or even as God. While worship of emperors was common in Rome, China and Japan (at the very least), this was a formal, ritual, even political act. It is doubtful that many embraced these men as their personal savior. But Jesus Christ was another matter entirely. Despite his life and death being accepted as historical fact (except for a while during the 19th century), he is mostly famous for his divinity. More locally, the Norse gods were explained as great kings of old by Snorri Sturlason in the early 1200s, and I read his explanation repeatedly when I was a boy. I had no idea until this year that this was called euhemerism, though. An unexpected twist to this topic comes from the prolific Japanese writer Ryuho Okawa. He claims that the ancient gods of Greece (and Japan, presumably many others as well) were in fact historical characters. 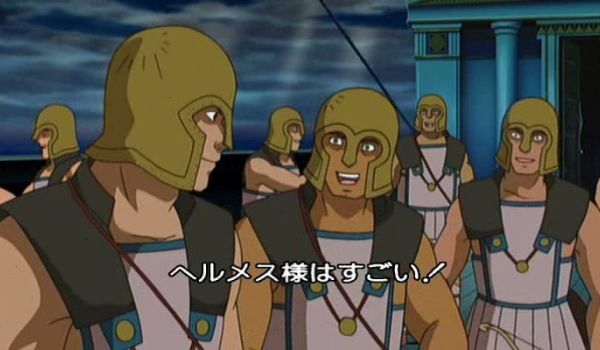 He even made an anime about one of them, Hermes, and this movie is still possible to buy on DVD. It was a big hit in Japan, but flopped completely in the USA. “Flew like a turkey” I believe is the local expression. Okawa’s view is a bit less rationalistic than classical euhemerism. He sees the ancient gods as historical men and women, yes, but they were filled with a spirit from Heaven. They were men and women with a mission from God, and this is why they were venerated after their passing. So he is not entirely dissing their divinity, but they were still mortals. In the tradition of Shinto, he refuses to see gods and mortals as fundamentally different. They are all aspects of the Divine. Okawa ought to know, if anyone does. Because he is already being worshiped as a god by hundreds of thousands of Japanese, and there are numerous temples dedicated to him. That is one of the things that makes him so interesting: He is a living case of euhemerism in action. Imagine if Zeus had a Twitter account, or Jesus Christ was videotaped during the Sermon on the Mount. Would they still be worshiped centuries after their passing from the world? Well, Jesus would, of course, since he is just that awesome. But at least he would not be portrayed as an Aryan photo model. So far, Okawa is doing well too in the being worshiped department, but he is not dead yet. His new religion is called “Happy Science”, and so – by a surely unplanned irony – the circle is closed. Old Euhemerus the scientist would perhaps have been amused. This entry was posted in history, religion by itlandm. Bookmark the permalink. You know, really, I think the “being worshiped” part is the part that bothers me the most about Okawa. Not only do I doubt his claims, which is my right and no big deal, it’s also very . . . arrogant? I’m tired, though, so I’m probably just rambling. It is not quite as simple as I portrayed it in passing. Okawa seems to think he is 1/5 of this awesome god, El Cantare, which is the one being worshipped. Okawa feels a duty to reveal as much as possible of the god’s teachings, since this is a unique chance to save the world. People officially worship El Cantare, but obviously there is no strict border between the god and the incarnation. In his books, Okawa does not tell people to worship him, but to do God’s will. But in practice, people just love to worship.